In a bowl, whisk together the flour, baking soda, powder and salt. In a separate bowl, whisk together the water, olive oil, sugar, lemon juice and vanilla extract until combined. Add the wet ingredients to the dry, stirring until combined. Fill the liners 3/4 of the way full with batter. Bake the cupcakes for 16 to 18 minutes, until they are just golden on top. Place the butter and mascarpone in the bowl of your electric mixer. Beat until creamy, then gradually add the powdered sugar a few spoonfuls at a time. Add the vanilla extract, scraping down the sides as needed. Beat the frosting on medium-high speed for 4 to 5 minutes until it’s fluffy. Scoop the frosting into jars or bowls, depending on how many colors you want to make. Use the guide on the back of the box to determine the intensity of your shades. 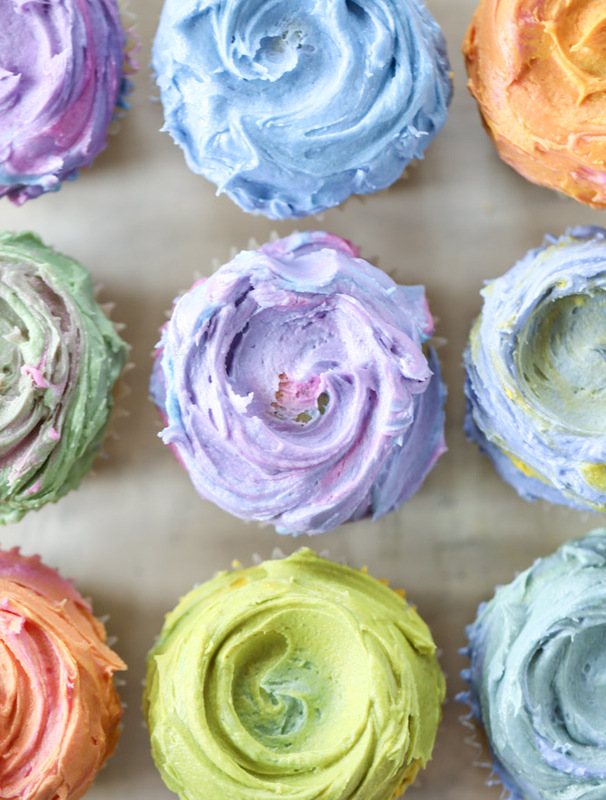 Mix the food colors into the frosting well until combined. If you’d like to do the rainbow swirl frosting, add a few colors on top of the cupcake and gently swirl with your knife, just a few times. Serve the cupcakes once frosted! All images and text @How Sweet Eats (originally adapted from food network and slightly adapted by COOC).